The Shure SLX Series wireless microphone systems provide the performance and reliability needed for use in venues, sound reinforcement etc. The UHF system is available in up to 8 different bands, over a 24MHz spectrum. This system includes the SLX4 receiver and SLX2 handheld transmitter with a Beta 87C microphone head. 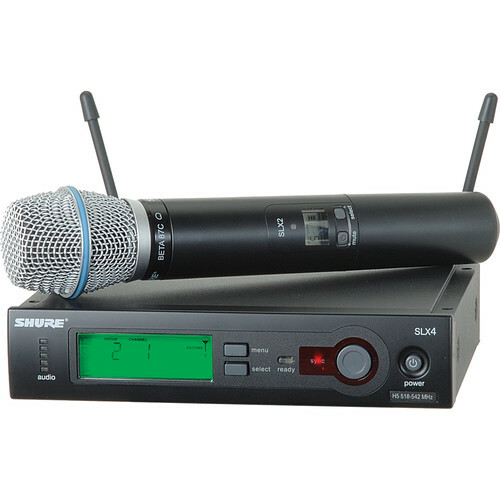 The SLX2 Handheld Transmitter features the Shure Beta 87C super-cardioid capsule. The Beta 87C provides a slight rise in high frequency response, resulting in improved vocal reproduction in live performances. The super-cardioid polar pattern provides off-axis noise rejection resulting in higher gain before feedback. The SLX2 is completely frequency agile featuring a choice of over 960 user selectable frequencies. Box Dimensions (LxWxH) 18.3 x 14.6 x 3.8"